Note: The topic of official controls overlaps with hygiene legislation. See: Food Hygiene Legislation of the EU. For all areas of legislation, the EU has left it to Member States to provide national enforcement and court procedures. With different legal practices and varied national control systems (whether centrally operated or managed or a federal or locally based system), harmonisation has never been considered practical or required. However, ensuring minimum standards of control has been necessary so as to provide confidence in the quality and safety of products from other Member States - and to provide minimum standards for products entering the EU from third countries (non-Member States). Perhaps the earliest move towards this was the adoption of minimum requirements for intra-Community trade in fresh meat - Directive 64/433. This required meat which was being 'sent from its territory to that of another Member State' to comply with minimum health requirements. In particular it had to have been inspected ante and post mortem by an 'official veterinarian'. It also required that the slaughterhouse and the cutting premises needed to have been approved by the 'competent central authority'. Subsequent controls on other products of animal origin mostly contained similar requirements. With the moves to create the 'Internal Market', increased trade amongst Member States meant that, with no border checks, there needed to be confidence in the national control systems applied by each Member State. This meant that minimum requirements had to be set and applied more widely in the food sector. As a starting point, a Directive (Directive 85/591) was adopted providing for the establishment of common methods of sampling and analysis. More significant were the setting of minimum control standards by Directive 89/397/EEC (on 'Official Controls') and, later, Directive 93/99/EEC (on 'Additional Measures'). 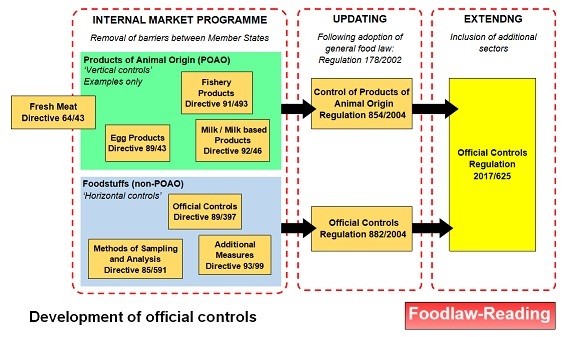 The food safety crises of the 1990s led to the adoption of the general food law (Regulation 178/2002) and the Commission was also committed to the adoption of a fully updated and expanded set of minimum requirements for national official food controls. This was achieved with the adoption of Regulation 882/2004. 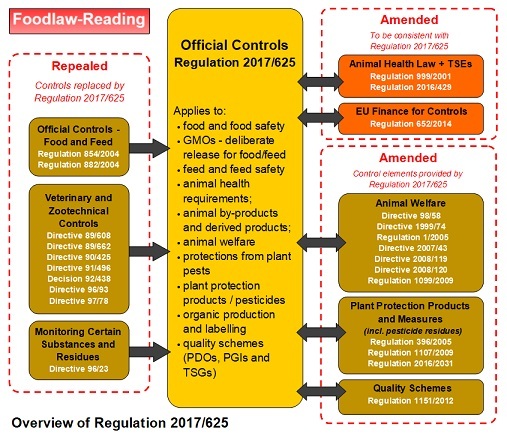 However the more detailed controls on products of animal origin (with the requirement for veterinary inspection) were combined into a separate document - Regulation 854/2004. Most recently a very significant widening of the official controls has been adopted which provides for a more standardised control structure across several related sectors. This now integrates the controls covering food and feed law, rules on animal health and welfare, plant health and plant protection products. The new Regulation 2017/625 will enter into force in December 2019. Some additional supporting controls are currently being prepared as 'implementing measures'.. This Regulation will mainly apply from 14 December 2019. For details of the adoption of this Regulation, see below. Provided by the Commission in April 2017. Available on this site (click on image). After agreement with the Council, the new controls were passed by the European Parliament on the 15 March 2017. Publication of the text was in April 2017 as Regulation (EU) 2017/625 - see above for details.